Anif Castle is charming and located in the town of the same name, which is located about 4 km south of Salzburg. The village itself is a suburb of the city and lies in the Austrian district of Salzburg. 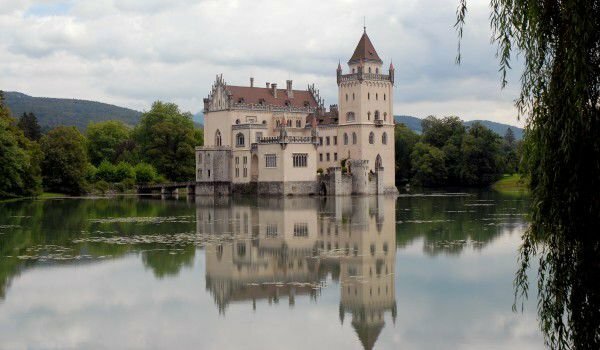 Anif Castle was built near the pond on the southern border of Salzburg and is also known as the Water Palace. The first written evidence of the existence of the Anif fortress being here comes from 1520. It is mentioned in the texts as the castle named Oberweiher, which is owned by a local judge contractor. After 1530 the palace was mentioned regularly in feud as it passes into the hands of the Archbishop of Salzburg. After this time the beautiful fortress became the residence of many church representatives. In 1918, public attention was drawn in Anif by the Bavarian King Ludwig III of whom was hidden in the castle with his family during the November Revolution. The declaration of Anif on 12th – 13th November of the same year the King refused to abdicate. By the 19th century the architecture of the palace in Anif was not impressive with anything special, but in 1838 and 1848 it was completely renovated in neo-Gothic style by the family Johannes Moy. The last major renovation was between 1995 and 2000. Today it is their private property and is not accessible to the community, which means that Anif can not organize tours. However, the family allows film producers to use facades and exterior spaces in major film strips. The décor of the Anif Castle was shot in the movie The Sound of Music. The beautiful Anif Castle was also home to the famous conductor Herbert von Karajan.